The North Carolina Agricultural & Technical State University and Hampton University family mourns the loss of Dr. Gladys Hope Franklin White, Hampton University Class of 1939, who passed away on Wednesday, November 7, 2018 at the age of 102. Dr. White was one of Hampton University’s most notable and influential alumna who positively impacted the entire campus. As she always said, she let her life do the singing. 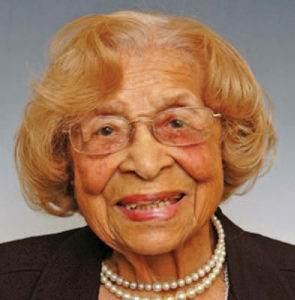 A native of Elizabeth City, N.C., White was born on March 22, 1916 and later attended Hampton Institute (today Hampton University), where she received a Bachelor of Science degree in elementary education and supervision. She later pursued her graduate degree at Columbia University where she earned a Master of Arts degree in curriculum, teaching, and reading. She also earned a Doctorate of Education in reading education from the University of Sarasota. White worked as an educator for more than 30 years. After her retirement from North Carolina A&T State University, she founded Project CARE – Coaching Accelerates Rich Excellence. Designed as the city’s first community church SAT/ACT Test Prep project, Project CARE has rendered invaluable assistance netting students’ scholarships and awards to colleges of their choice. Her distinguished career as an accomplished educator and administrator included more than 50 years of experience across all levels. As a distinguished Hamptonian and the university’s top fundraiser, White raised millions of dollars on behalf of her beloved alma mater. She is the name sake for Gladys Hope Franklin White Hall on the Hampton University campus and was an active member of the National Hampton Alumni Association (NHAA), Inc. Board. She also served as the Emeritus Class Leader. Passionate about her community and education, Dr. White was a lifetime member of several organizations, including the National Education Association, the International Reading Association and Delta Sigma Theta Sorority, Inc. She was also a member of the Greensboro Chapter of The Links Incorporated. In 2014, Dr. White received the Lifetime Achievement Award at the National Black College Alumni Hall of Fame ceremony in Atlanta. Hall of Fame honorees are Black college graduates who through work, participation or support, have brought honor and recognition to their alma mater, their profession and their community. They are held in high esteem by their peers, and are deemed to be of high moral character and outstanding integrity. In 2015, Dr. White was honored by Hampton University president, Dr. William R. Harvey, with the Presidential Citizenship Award recognizing her as a positive role model for others and who, through her service to her community, contributed to the values of decency, dignity, and improvement in the quality of life for others. White is preceded in death by her husband, Dr. Frank H. White, graduate of Hampton University and the former dean of North Carolina A&T State University’s College of Arts and Sciences; and by her daughter, Dr. Sharon White Williams, associate professor at Hampton University. She is survived by her daughter, Hampton graduate, The Honorable Johnese White Howard of Dallas, Texas, two granddaughters, who are both Hamptonians, one grandson and many other family and friends. The funeral for Dr. Gladys White will take place Friday, November 16. Family visitation is will be from 10 a.m. to 11 a.m. Funeral services will begin at 11 a.m. at Trinity AME Zion Church, 631 East Florida St.
On Saturday, November 17, the Hampton University Marching Force will perform a musical tribute to Dr. Gladys Hope Franklin White at halftime of the Hampton Pirates football game. The game will begin at 1 p.m. at Armstrong Stadium.